BEERY XMAS—With San Diego County being America’s nirvana of craft beer breweries (60-plus), we didn’t have far to go to learn what tasty brewery craft beers would be cool to put under the tree; bring to an office party or take to a home pot luck gathering. We asked the editors of West Coaster, the region’s leading craft beer publication that’s dedicated to all things craft beer to suggest a few craft beers that are just right. Here’s what Ryan Lamb and Mike Shess, editor and publisher respectively of West Coaster believe make excellent xmas gifts. Office Gift: Good idea here is to mix and match breweries and types of beers. For the office party buy the following three beers put them in a recycled coffee carry bag, slip a card in and add a big bow for under $20: Coronado Brewing Co.’s Orange Avenue Wit; Karl Strauss Brewing Co.’s Red Trolley Ale and Ballast Point Brewing Co.’s Big Eye India Pale Ale. Buy the Case: Making a stop at the store before that holiday party? Grab a case of Sierra Nevada Brewing Co.’s Celebration Ale, a “fresh hop” winter seasonal beer that has for many years been a benchmark of the American IPA style. Growler Affection: Gift a growler, that’s a hefty half gallon or full gallon of craft beer, available from a majority of the local brewing companies including Alpine, Hess, Green Flash, Ballast Point, Karl Strauss, and Pizza Port. 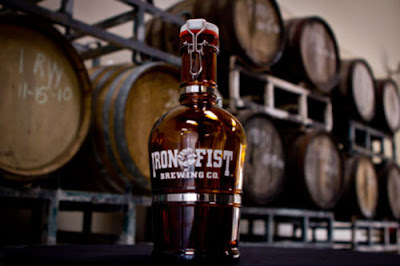 The initial purchase is the most expensive, around $25, as you buy the reusable growler glassware along with the beer. Seasonal Selections: AleSmith Brewing's Winter Yulesmith and Port Brewing's Santa's Little Helper are both “big” (read high alcohol) beers that are acclaimed worldwide for their craftsmanship and quality year after year. For the Dinner Table: Grab a “bomber” (22oz bottle of beer) or two from Poway's Lightning Brewery. The Electrostatic Ale in particular pairs quite well with big, hearty holiday meals. Where to buy: For updates on all San Diego area craft beer brewers, retailers and brew pubs go to www.westcoastersd.com and download the latest edition of West Coaster or pick up a hard copy and leading craft beer outlets county-wide. Image: Vista’s Iron Fist Brewing Co. Growler.